It’s been 10 days of non-stop challah baking madness at my house and I’ve quickly learned why making challah is such a beloved tradition. I’m even thinking about getting these challah-shaped earrings to commemorate the experience. If you’re new to challah, it’s quite possibly the most enjoyable type of bread to make. Not only do you get to twist, shape and braid the dough into beautiful works of art, but each shape holds symbolic meaning adding a deeper connection to the process. 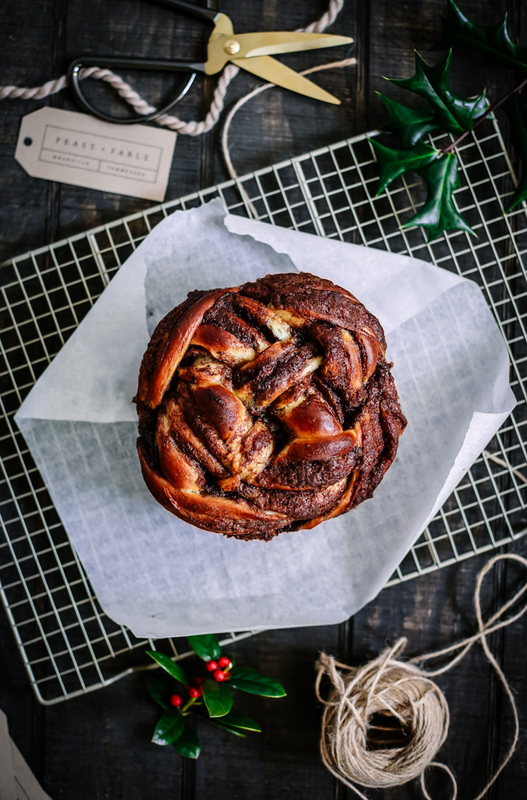 This loaf of Cinnamon Challah Bread is pure magic. It embodies everything I love about a Panera Cinnamon Crunch Bagel, but with a richer, eggier dough and a beautiful 4-strand braid. I made it babka-style and filled the dough with a cinnamon and brown sugar paste before rolling it up and slicing it down the middle to expose the layers. I love how the cinnamon bakes into a nice crumb and makes for a visual maze of golden, cinnamon-crisped challah. I can’t think of a single person who wouldn’t devour this challah bread, which makes it the perfect gift! Especially when it comes wrapped in one of these beautiful Hearth and Hand kitchen towels! If you’re looking for a thoughtful holiday hostess gift — this. is. it. And spoiler alert - it makes for an unbelievable french toast casserole and I may or may not have that recipe on the blog next week :). It’s the gift that keeps on giving! To make the dough in advance, simply mix the dough and place it in a lightly oiled bowl. Cover tightly with plastic wrap and place in the refrigerator overnight for its first rising. Then, take it out and let it come to room temperature. Continue following the directions below to shape and bake. You can easily adapt this recipe to whatever braid or style you like. I like a 4-strand braid and this video gives an excellent visual tutorial. I intended to photograph the process, but lost my light too soon (curse you daylight savings!). Other ideas include a simple twist or 3-strand braid. While you can bake your challah free form on a sheet pan lined with parchment paper, I like to bake round loaves in cake pans to give them some height. I made this recipe using 6” cake pans. When gifting, first wrap loosely with parchment paper and then wrap in the kitchen towel to keep the towel clean! As always, thanks for stopping by and I hope you enjoy this recipe! Happy Holidays! First, test the yeast to make sure it is still active. Fill a measuring cup with 1 cup warm water, add the yeast and a pinch of sugar. Stir to dissolve and let stand until you see a thin frothy layer form on the top and the active yeast begin to rise to the surface. This should take anywhere from 4 - 10 minutes. Meanwhile, whisk together the flour, salt and sugar in the bowl of a standing mixer (or a large bowl if kneading by hand). Then, make a well in the center of the flour mixture and add the eggs, egg yolk and oil. Whisk the eggs and oil together and pull in a little bit of flour from the sides of the bowl to create a slurry. Next, pour the yeast mixture over the egg slurry and use a wooden spoon to mix the yeast, eggs and flour until a rough, shaggy dough is formed. If using a standing mixer, use the dough hook attachment to knead the dough on low for about 6 to 7 minutes. If kneading by hand, turn the dough out onto a floured work surface and knead for about 10 minutes. If the dough is too sticky, add a sprinkle of flour. The dough is finished kneading when it’s soft and smooth. While the dough is rising, make the filling. Place the brown sugar, cinnamon, vanilla extract and a pinch of salt in a bowl and stir to combine. Then, pour in the melted butter and stir to form a paste, set aside. To make two smaller loaves, cut the dough into four equal pieces. Set two pieces aside and cover with a kitchen towel. Take the remaining two pieces and roll each into a large rectangle. Then, use an offset spatula or the back of a spoon to spread the filling evenly all over. Roll the dough up lengthwise, to form a long rope and pinch the ends. Set aside and repeat with the other piece of dough. Once you have two filled ropes, place seam side down and use a sharp knife to cut each piece down the center lengthwise. You should now have four pieces to begin braiding. To complete the 4-strand braid, I encourage you to watch this video: https://www.youtube.com/watch?v=dj8tuQ1RojM. It really is simple, but so much easier to watch instead of read! Once you’ve got the braid down, repeat the process with the other two pieces of dough to form two loaves. Note: it’s okay if it gets a little messy with the filling - it’s what makes the outer crust so delicious! Once you’re challah is braided, you can either place it on a baking sheet or in a parchment lined cake tin. Then, cover and let rise for another 30-60 minutes. Meanwhile, preheat the oven to 350 degrees F. Once the challah looks nice and puffy, brush with the remaining egg white and place in the oven to bake for about 30-35 minutes. The challah bread is ready when it’s golden brown and the internal temperature reads 195 degrees F.
Once baked, remove from the oven and let cool. Then, slice and enjoy!